Nephrocalcinosis is a condition in which calcium levels in the kidneys are increased. Most often, the increase in renal calcium is generalized, as opposed to the localized increase observed in calcified renal infarct and caseating granulomas of renal tuberculosis. See the image below. Axial CT scans from patient with long history of renal tubular acidosis. Images show bilateral medullary nephrocalcinosis (early arterial phase). Presentation is primarily determined by the underlying etiology, though in many cases, the condition remains asymptomatic and is identified only as a radiologic abnormality. The physical findings are nonspecific and reflect the underlying disorders responsible. Magnetic resonance imaging (MRI) offers no advantages over these modalities and is not warranted unless another compelling indication is present. Parathyroidectomy may be considered for removal of enlarged adenomas. Microscopic nephrocalcinosis is characterized by the presence of microscopic crystalline calcium precipitates in the form of oxalate or phosphate. Patients with macroscopic nephrocalcinosis have larger areas of calcifications, which can be observed on visual or radiologic examination without further magnification. Patients with hypercalcemia develop renal function abnormalities. Under these circumstances, the term hypercalcemic nephropathy is more appropriate than is the older term chemical nephrocalcinosis. Calcium is a critical divalent cation that is transported, along with sodium, potassium, and water, in a complex and regulated manner along the renal tubular epithelium. The cytoplasmic concentration of calcium is tightly regulated and kept very low, being maintained by active extracellular extrusion of calcium and sequestration into the endoplasmic reticulum and mitochondria. Increased extracellular calcium leads to impairment of the calcium messenger system with gross tubular impairment. The effects of increased calcium have been studied extensively in rats. Rats treated with vitamin D demonstrated mitochondrial swelling and loss of mitochondrial enzyme activities before calcification appeared. Parathyroid extract−induced hypercalcemia was found to cause changes in rat kidneys, predominantly affecting the distal nephron, with focal necrosis of the outer medullary collecting ducts and the ascending limb of the loop of Henle. Hypercalcemia results in renal vasoconstriction and a reduced glomerular filtration rate. 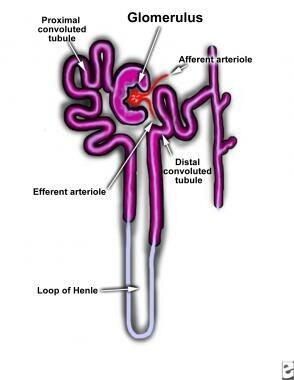 It also interferes with renal tubular functions. Impaired renal concentration ability and resistance to vasopressin are the most common defects observed with hypercalcemia. These changes may be mediated by reduced sodium transport in the loop of Henle (see the image below) and by antidiuretic hormone antagonism via calcium-sensing receptors,  or they may be related to medullary prostaglandin synthesis. Maximum diluting capacity remains unimpaired. Effectively, the sum effect of this process will be a clinical picture resembling that of nephrogenic diabetes insipidus. The effects on the acid-base balance are even more complex. Increased renal acid excretion occurs with intravenous (IV) calcium infusions, and metabolic alkalosis has frequently been reported in patients with hypercalcemia. On the other hand, parathyroid hormone decreases hydrogen ion excretion, leading to a distal type of renal tubular acidosis (RTA). This opposing effect of hypercalcemia and parathyroid hormone has been used in the differential diagnosis of hypercalcemia, because serum bicarbonate is lower and chloride is higher when hyperparathyroidism is the cause of hypercalcemia. At autopsy, healthy human kidneys invariably contain microscopic deposits of calcium in the renal medulla. Microscopic nephrocalcinosis can occur without macroscopic involvement in patients with longstanding hypercalcemia from primary parathyroidism, milk-alkali syndrome, or primary hyperoxaluria. Different patterns of microscopic nephrocalcinosis have been described. The cortical pattern has been found after parenteral calcium administration. The corticomedullary type involves calcium phosphate deposits that occur in the inner zone of the renal cortex and extend into the medulla. Precipitating factors include excess parathyroid hormone, vitamin D, acetazolamide, magnesium depletion, decreased urinary citrate, and hypothyroid state. Increased plasma calcium is not an essential prerequisite for this type of nephrocalcinosis. The medullary pattern has been reported in hyaline droplet nephropathy resulting from inhalation of volatile hydrocarbons. The pelvic type affects renal papillae. The deposits usually are calcium phosphate, but calcium oxalate also has been implicated. The underlying mechanism appears to be either increased intestinal absorption or decreased renal excretion of calcium. Macroscopic nephrocalcinosis refers to calcium deposition that is visible without magnification and usually is discovered by means of conventional radiography, ultrasonography, or computed tomography (CT) or at autopsy. Macroscopic nephrocalcinosis can affect either the cortex or the medulla, with the latter site being more commonly involved. Cortical nephrocalcinosis is rare and usually occurs secondary to diffuse cortical disease injury. The calcification can be patchy or confluent. In chronic glomerulonephritis, calcium deposits are found most often in periglomerular tissue and not in the glomerulus. Nephrocalcinosis also has been reported in familial infantile nephrotic syndrome and in Alport syndrome. Acute cortical necrosis secondary to toxemia of pregnancy, snakebite, or hemolytic-uremic syndrome can lead to patchy cortical nephrocalcinosis. Calcium deposition can start as early as 30 days after cortical necrosis. Chronic pyelonephritis and vesicoureteral reflux are also implicated. Renal transplantation, primary hyperoxaluria, methoxyflurane abuse, autosomal recessive polycystic kidney disease, and benign nodular cortical nephrocalcinosis may be involved in cortical nephrocalcinosis, albeit rarely. Medullary nephrocalcinosis assumes the form of small nodules of calcification clustered in each pyramid. Diagnosing the underlying renal disease on the basis of the appearance is difficult. Characteristic exceptions include papillary necrosis due to analgesic abuse and medullary sponge kidneys. In papillary necrosis, the entire papilla may be calcified, whereas in medullary sponge kidney, there is a characteristic band of calcification in the renal pyramids. It has been suggested that when hypercalcemia is the most important factor, the first foci of calcification develop in the renal tubular cells, whereas when hypercalciuria is the major factor, the initial foci form in the interstitium. Intraluminal tubular calcium crystals are believed to serve as potential nidi for further buildup of calcium and other stone-forming substances, including oxalate and uric acid. Whether further growth of nephroliths occurs probably depends on a number of additional factors, such as abnormal urine composition, urine flow and volume, and the presence or absence of endogenous inhibitors of crystalline formation in the urine. Primary hyperparathyroidism is the single most common cause of nephrocalcinosis in adults. Although nephrocalcinosis is a relatively rare complication (5%), primary hyperparathyroidism itself is relatively common, especially in the elderly. Nephrocalcinosis is related more to the duration than to the intensity of hypercalcemia. The classic clinical findings are sometimes referred to as “(abdominal) groans, stones, and bones.” This common phrase is a reminder that patients may present with kidney stones, bone pain, osteoporosis, and pathologic fractures, all of which can result in abdominal discomfort. Rarely, hyperparathyroidism can be associated with multiple endocrine neoplasia type 1 (MEN1). Distal RTA is the second most common cause of medullary nephrocalcinosis. The familial form and the secondary form (autoimmune-associated anti-K/H channel antibody) are common. The mechanisms contributing to nephrocalcinosis in distal RTA are hypercalcemia, hypercalciuria, metabolic acidosis, and reduced citrate excretion in the presence of increased urinary pH. Because medullary nephrocalcinosis itself can cause distal RTA, distinguishing the initial insult can be difficult. Renal function is fairly well maintained. In granulomatous disorders, conversion of 25-hydroxycholecalciferol to 1,25-dihydroxycholecalciferol in the granuloma is increased, resulting in an unregulated production of bioactive vitamin D with resultant excessive intestinal absorption of calcium and phosphorus. In addition, cytokines (eg, interleukin [IL]-2) released in these disorders cause dysregulation of calcium homeostasis and activation of osteoclasts, resulting in subacute and chronic hypercalcemia. Any other cause of hypercalcemia, particularly when associated with hypercalciuria, can contribute to nephrocalcinosis. Etiologies include milk-alkali syndrome (due to excess ingestion of antacids), hyperparathyroidism, and malignant disease (due to bone involvement and humoral factors, including cytokines and parathyroid hormone-related peptide). 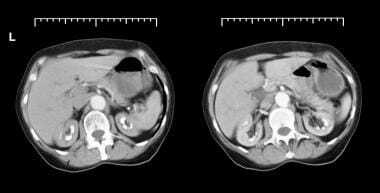 Idiopathic hypercalciuria, [13, 14] a common metabolic disease, is also known to cause nephrocalcinosis. Nephrocalcinosis and renal failure are increasingly being recognized as common complications of phosphate supplementation, particularly in the elderly. [15, 16, 17, 18, 19] Other possible risk factors are preexisting renal failure, high blood pressure, and pharmacologic treatment of high blood pressure (eg, with angiotensin-converting enzyme [ACE] inhibitors or angiotensin-receptor blockers [ARBs]). Phosphate supplements may contribute to renal calcifications in children with hypophosphatemic rickets. In vitro studies have shown that an increased urinary concentration of phosphate can result in intratubular crystallization with altered solubility. Medullary sponge kidney is a common cause of medullary calcification, with calcium lying in dilated collecting ducts rather than in the renal substance. These ectatic outpouchings are believed to be areas of urinary stasis possessing the ideal characteristics for fostering the formation of these calcifying complexes. The calcium deposits are larger and more sharply defined than they are in metabolic disease, and they are uneven in distribution. Associated hemihypertrophy of the body may exist. Unlike the severe renal damage with minimal calcification associated with hypercalcemic states, nephrocalcinosis associated with distal RTA and medullary sponge kidney usually is gross, and renal function is relatively well preserved. Renal papillary necrosis associated with analgesic nephropathy is identified as calcified papillae rather than as a speckled pattern. Other associations with nephrocalcinosis include rapidly progressive osteoporosis due to immobilization, menopause, aging, or steroids. Medullary calcification can be induced by primary (familial) hyperoxaluria or by secondary hyperoxaluria due to increased intake of oxalates, enhanced absorption resulting from intestinal disease, or ingestion of ethylene glycol or methoxyflurane. [20, 21] Primary hyperoxaluria and ethylene glycol intoxication are also associated with diffuse calcium-oxalate depositions in many other organs, including the eye and the heart. Chronic hypokalemic states, such as Bartter syndrome, primary hyperaldosteronism, Liddle syndrome, and 11-beta hydroxylase deficiency, are associated with reduced urine citrate excretion and tubular epithelial damage, leading to calcium precipitations. Autosomal dominant hypophosphatemic rickets and X-linked hypophosphatemic conditions  have been associated with abnormal phosphate wastage and nephrocalcinosis due to elevated levels of phosphatonins (fibroblast growth factor 23; secreted frizzled-related protein 4). [4, 5] Nephrocalcinosis is very common (frequency ~80% on ultrasonography) and may be associated with phosphate supplementation for the condition. Dent disease and familial magnesium-losing nephropathy are rare inherited diseases causing medullary calcification. Inherited forms of magnesium-losing nephropathy have been described. Familial hypomagnesemia hypercalciuric nephrocalcinosis (FHHNC) is an autosomal recessive disease associated with cation loss through a defect in a renal tight junction protein claudin-16 (paracellin-1) [25, 26, 27] or claudin-19 [28, 29] involved in paracellular transport. Claudin-16/paracellin-1 is dysfunctional in familial hypomagnesemia with hypercalciuria and nephrocalcinosis (FHHNC). However, hypomagnesemia is not a mandatory finding in all kindreds  . Thiazide-type diuretics appears efffective in lessning hypercelcuria and nephrocalcinosis. Associated malignancies are not typical in nephrocalcinosis, because patients seldom survive long enough with hypercalcemia to develop them; a possible exception is parathyroid carcinoma. Familial benign hypercalcemia and hyperthyroidism are not associated with renal calcification. Premature sick infants have been observed to develop diffuse nephrocalcinosis (noted in about two thirds of infants with birth weights of < 1500 g), typically when exposed to diuretic therapy or prolonged oxygen therapy. No clearly effective treatment has been established,  although the natural history of this phenomenon is not well understood. Most cases resolve within a year [33, 34] and only a small proportion (< 15%) of stones require interventions. Urinary tract infections after birth represent another risk factor for slow resolution of these calcifications. There has been a growing awareness of the diffusely increased calcifications in patients with advanced renal failure and end-stage renal disease. In the uremic environment, the use of large, pharmacologic doses of vitamin-D analogues and calcium-based phosphorus binders appears to accelerate the process. The presence of extraskeletal calcifications seems to be more closely correlated with the calcium-phosphorus product (sometimes referred to as the double product) and total-body calcium overload than with the presence of hypercalcemia. Calcifications in such cases are not limited to the kidneys but may involve multiple organs, including the heart, vascular beds, parenchymal organs, skin, and subcutaneous tissues. The morbidity and mortality associated with nephrocalcinosis depend on the disease associated with the condition rather than on the nephrocalcinosis itself. The major long-term complication in patients with medullary nephrocalcinosis is renal failure. Early treatment of reversible causes of renal failure, such as urinary infections, obstruction, and hypertension, is essential. Once chronic renal failure has developed, treatment should focus on appropriate management of chronic kidney disease and its complications. The exact epidemiology and disease burden for nephrocalcinosis is not known. Prematurity-associated calcifications are known to resolve, albeit with significant inter-individual variability. Younger age in general is very suspicious for underlying genetic disorders, such as Bartter syndrome, [39, 40] Dent disease or variants of Dent disease,  or amelogenesis imperfecta. [29, 30] Whole-exome sequencing is a novel and very powerful technology to detect a monogenic cause of nephrocalcinosis and early-onset nephrolithiasis.87 In older age groups, acquired processes such as distal renal tubular acidosis are more likely to occur. [10, 42] . Tasic V, Gucev Z. Nephrolithiasis and Nephrocalcinosis in Children - Metabolic and Genetic Factors. Pediatr Endocrinol Rev. 2015 Sep. 13 (1):468-76. [Medline]. Sands JM, Naruse M, Baum M, et al. Apical extracellular calcium/polyvalent cation-sensing receptor regulates vasopressin-elicited water permeability in rat kidney inner medullary collecting duct. J Clin Invest. 1997 Mar 15. 99(6):1399-405. [Medline]. [Full Text]. Epstein FH. Calcium and the kidney. Am J Med. 1968 Nov. 45(5):700-14. [Medline]. Jonsson KB, Zahradnik R, Larsson T, et al. Fibroblast growth factor 23 in oncogenic osteomalacia and X-linked hypophosphatemia. N Engl J Med. 2003 Apr 24. 348(17):1656-63. [Medline]. [Full Text]. Schiavi SC, Kumar R. The phosphatonin pathway: new insights in phosphate homeostasis. Kidney Int. 2004 Jan. 65(1):1-14. [Medline]. Evan AP, Lingeman J, Coe F, et al. Renal histopathology of stone-forming patients with distal renal tubular acidosis. Kidney Int. 2007 Apr. 71(8):795-801. [Medline]. Oguzkurt L, Karabulut N, Haliloglu M, et al. Medullary nephrocalcinosis associated with vesicoureteral reflux. Br J Radiol. 1997 Aug. 70(836):850-1. [Medline]. [Full Text]. Gambaro G, Feltrin GP, Lupo A, et al. Medullary sponge kidney (Lenarduzzi-Cacchi-Ricci disease): a Padua Medical School discovery in the 1930s. Kidney Int. 2006 Feb. 69(4):663-70. [Medline]. Karet FE. Inherited distal renal tubular acidosis. J Am Soc Nephrol. 2002 Aug. 13(8):2178-84. [Medline]. [Full Text]. Trepiccione F, Prosperi F, de la Motte LR, Hübner CA, Chambrey R, Eladari D, et al. New Findings on the Pathogenesis of Distal Renal Tubular Acidosis. Kidney Dis (Basel). 2017 Dec. 3 (3):98-105. [Medline]. Scarpelli DG, Tremblay G, Pearce AG. A comparative cytochemical and cytologic study of vitamin D induced nephrocalcinosis. Am J Pathol. 1960 Mar. 36:331-53. [Medline]. [Full Text]. Gobel U, Kettritz R, Schneider W, et al. The protean face of renal sarcoidosis. J Am Soc Nephrol. 2001 Mar. 12(3):616-23. [Medline]. [Full Text]. Frick KK, Bushinsky DA. Molecular mechanisms of primary hypercalciuria. J Am Soc Nephrol. 2003 Apr. 14(4):1082-95. [Medline]. [Full Text]. Gigante M, Santangelo L, Diella S, Caridi G, Argentiero L, D''Alessandro MM, et al. Mutational Spectrum of CYP24A1 Gene in a Cohort of Italian Patients with Idiopathic Infantile Hypercalcemia. Nephron. 2016. 133 (3):193-204. [Medline]. Markowitz GS, Stokes MB, Radhakrishnan J, et al. Acute phosphate nephropathy following oral sodium phosphate bowel purgative: an underrecognized cause of chronic renal failure. J Am Soc Nephrol. 2005 Nov. 16(11):3389-96. [Medline]. [Full Text]. Markowitz GS, Nasr SH, Klein P, et al. Renal failure due to acute nephrocalcinosis following oral sodium phosphate bowel cleansing. Hum Pathol. 2004 Jun. 35(6):675-84. [Medline]. Hurst FP, Bohen EM, Osgard EM, et al. Association of oral sodium phosphate purgative use with acute kidney injury. J Am Soc Nephrol. 2007 Dec. 18(12):3192-8. [Medline]. [Full Text]. Ori Y, Herman M, Tobar A, et al. Acute phosphate nephropathy-an emerging threat. Am J Med Sci. 2008 Oct. 336(4):309-14. [Medline]. Balaban DH. Guidelines for the safe and effective use of sodium phosphate solution for bowel cleansing prior to colonoscopy. Gastroenterol Nurs. 2008 Sep-Oct. 31(5):327-34; quiz 334-5. [Medline]. Leumann E, Hoppe B. The primary hyperoxalurias. J Am Soc Nephrol. 2001 Sep. 12(9):1986-93. [Medline]. [Full Text]. Hoppe B, Langman CB. A United States survey on diagnosis, treatment, and outcome of primary hyperoxaluria. Pediatr Nephrol. 2003 Oct. 18(10):986-91. [Medline]. Alon U, Lovell HB, Donaldson DL. Nephrocalcinosis, hyperparathyroidism, and renal failure in familial hypophosphatemic rickets. Clin Pediatr (Phila). 1992 Mar. 31(3):180-3. [Medline]. Hoopes RR Jr, Shrimpton AE, Knohl SJ, et al. Dent Disease with mutations in OCRL1. Am J Hum Genet. 2005 Feb. 76(2):260-7. [Medline]. [Full Text]. Benigno V, Canonica CS, Bettinelli A, et al. Hypomagnesaemia-hypercalciuria-nephrocalcinosis: a report of nine cases and a review. Nephrol Dial Transplant. 2000 May. 15(5):605-10. [Medline]. [Full Text]. Weber S, Schneider L, Peters M, et al. Novel paracellin-1 mutations in 25 families with familial hypomagnesemia with hypercalciuria and nephrocalcinosis. J Am Soc Nephrol. 2001 Sep. 12(9):1872-81. [Medline]. [Full Text]. Knoers NV. Inherited forms of renal hypomagnesemia: an update. Pediatr Nephrol. 2008 Sep 26. [Medline]. Claverie-Martin F. Familial hypomagnesaemia with hypercalciuria and nephrocalcinosis: clinical and molecular characteristics. Clin Kidney J. 2015 Dec. 8 (6):656-664. [Medline]. Claverie-Martin F. Familial hypomagnesaemia with hypercalciuria and nephrocalcinosis: clinical and molecular characteristics. Clin Kidney J. 2015 Dec. 8 (6):656-64. [Medline]. Yamaguti PM, Neves FA, Hotton D, Bardet C, de La Dure-Molla M, Castro LC, et al. Amelogenesis imperfecta in familial hypomagnesaemia and hypercalciuria with nephrocalcinosis caused by CLDN19 gene mutations. J Med Genet. 2017 Jan. 54 (1):26-37. [Medline]. Sikora P, Zaniew M, Haisch L, Pulcer B, Szczepańska M, Moczulska A, et al. Retrospective cohort study of familial hypomagnesaemia with hypercalciuria and nephrocalcinosis due to CLDN16 mutations. Nephrol Dial Transplant. 2015 Apr. 30 (4):636-44. [Medline]. Schell-Feith EA, Moerdijk A, van Zwieten PH, et al. Does citrate prevent nephrocalcinosis in preterm neonates?. Pediatr Nephrol. 2006 Dec. 21(12):1830-6. [Medline]. Schell-Feith EA, Kist-van Holthe JE, van der Heijden AJ. Nephrocalcinosis in preterm neonates. Pediatr Nephrol. 2010 Feb. 25(2):221-30. [Medline]. Huynh M, Clark R, Li J, Filler G, Dave S. A case control analysis investigating risk factors and outcomes for nephrocalcinosis and renal calculi in neonates. J Pediatr Urol. 2017 Aug. 13 (4):356.e1-356.e5. [Medline]. Andrioli V, Highmore K, Leonard MP, Guerra LA, Tang K, Vethamuthu J, et al. Infant nephrolithiasis and nephrocalcinosis: Natural history and predictors of surgical intervention. J Pediatr Urol. 2017 Aug. 13 (4):355.e1-355.e6. [Medline]. Evenepoel P, Daenen K, Bammens B, Claes K, Meijers B, Naesens M, et al. Microscopic nephrocalcinosis in chronic kidney disease patients. Nephrol Dial Transplant. 2015 May. 30 (5):843-8. [Medline]. Cozzolino M, Staniforth ME, Liapis H, et al. Sevelamer hydrochloride attenuates kidney and cardiovascular calcifications in long-term experimental uremia. Kidney Int. 2003 Nov. 64(5):1653-61. [Medline]. Tang X, Bergstralh EJ, Mehta RA, Vrtiska TJ, Milliner DS, Lieske JC. Nephrocalcinosis is a risk factor for kidney failure in primary hyperoxaluria. Kidney Int. 2015 Mar. 87 (3):623-31. [Medline]. Gambaro G, Goldfarb DS, Baccaro R, Hirsch J, Topilow N, D'Alonzo S, et al. Chronic pain in medullary sponge kidney: a rare and never described clinical presentation. J Nephrol. 2018 Feb 21. [Medline]. Vergine G, Fabbri E, Pedini A, Tedeschi S, Borsa N. Bartter Syndrome Type 1 Presenting as Nephrogenic Diabetes Insipidus. Case Rep Pediatr. 2018. 2018:9175271. [Medline]. Wongsaengsak S, Vidmar AP, Addala A, Kamil ES, Sequeira P, Fass B, et al. A novel SLC12A1 gene mutation associated with hyperparathyroidism, hypercalcemia, nephrogenic diabetes insipidus, and nephrocalcinosis in four patients. Bone. 2017 Apr. 97:121-125. [Medline]. Anglani F, Terrin L, Brugnara M, Battista M, Cantaluppi V, Ceol M, et al. Hypercalciuria and nephrolithiasis: Expanding the renal phenotype of Donnai-Barrow syndrome. Clin Genet. 2018 Mar 13. [Medline]. Evans R, Zdebik A, Ciurtin C, Walsh SB. Renal involvement in primary Sjögren’s syndrome. Rheumatology. 2015 Jun 10. 54(9):1541-8. Sanderson PH. Functional aspects of renal calcification in rats. Clin Sci (Lond). 1959 Feb. 18(1):67-79. [Medline]. Al-Modhefer AK, Atherton JC, Garland HO, et al. Kidney function in rats with corticomedullary nephrocalcinosis: effects of alterations in dietary calcium and magnesium. J Physiol. 1986 Nov. 380:405-14. [Medline]. [Full Text]. Koruyucu M, Seymen F, Gencay G, Gencay K, Tuna EB, Shin TJ, et al. Nephrocalcinosis in Amelogenesis Imperfecta Caused by the FAM20A Mutation. Nephron. 2018 Feb 13. [Medline]. Keskin M, Savaş-Erdeve Ş, Sağsak E, Çetinkaya S, Aycan Z. Risk factors affecting the development of nephrocalcinosis, the most common complication of hypophosphatemic rickets. J Pediatr Endocrinol Metab. 2015 Nov 1. 28 (11-12):1333-7. [Medline]. Outcome of adult patients with X-linked hypophosphatemia caused by PHEX gene mutations. Chandrashekar KB, Fulop T, Juncos LA. Medical management and prevention of nephrolithiasis. Am J Med. 2012 Apr. 125 (4):344-7. [Medline]. Hoppe B, Kemper MJ. Diagnostic examination of the child with urolithiasis or nephrocalcinosis. Pediatr Nephrol. 2008 Dec 23. [Medline]. Hoppe B, Kemper MJ. Diagnostic examination of the child with urolithiasis or nephrocalcinosis. Pediatr Nephrol. 2010 Mar. 25(3):403-13. [Medline]. [Full Text]. Cheidde L, Ajzen SA, Tamer Langen CH, et al. A critical appraisal of the radiological evaluation of nephrocalcinosis. Nephron Clin Pract. 2007. 106(3):c119-24. [Medline]. Curry NS, Gordon L, Gobien RP, et al. Renal medullary "rings": possible CT manifestation of hypercalcemia. Urol Radiol. 1984. 6(1):48-50. [Medline]. Barre PE, Gascon-Barre M, Meakins JL, et al. Hydroxychloroquine treatment of hypercalcemia in a patient with sarcoidosis undergoing hemodialysis. Am J Med. 1987 Jun. 82(6):1259-62. [Medline]. Jamerson K, Weber MA, Bakris GL, et al. Benazepril plus amlodipine or hydrochlorothiazide for hypertension in high-risk patients. N Engl J Med. 2008 Dec 4. 359(23):2417-28. [Medline]. Sakhaee K, Nicar M, Hill K, et al. Contrasting effects of potassium citrate and sodium citrate therapies on urinary chemistries and crystallization of stone-forming salts. Kidney Int. 1983 Sep. 24(3):348-52. [Medline]. Bhagat SK, Chacko NK, Kekre NS, et al. Is there a role for tamsulosin in shock wave lithotripsy for renal and ureteral calculi?. J Urol. 2007 Jun. 177(6):2185-8. [Medline]. Gupta S, Gao JJ, Emmett M, Fenves AZ. Topiramate and metabolic acidosis: an evolving story. Hosp Pract (1995). 2017 Sep 1. 1-4. [Medline]. Huynh M, Clark R, Li J, Filler G, Dave S. A case control analysis investigating risk factors and outcomes for nephrocalcinosis and renal calculi in neonates. J Pediatr Urol. 2017 Jul 27. [Medline]. Finsterer J, Scorza FA. Renal manifestations of primary mitochondrial disorders. Biomed Rep. 2017 May. 6 (5):487-494. [Medline]. Fogo AB, Lusco MA, Najafian B, Alpers CE. AJKD Atlas of Renal Pathology: Nephrocalcinosis and Acute Phosphate Nephropathy. Am J Kidney Dis. 2017 Mar. 69 (3):e17-e18. [Medline]. Soliman NA, Nabhan MM, Abdelrahman SM, Abdelaziz H, Helmy R, Ghanim K, et al. Clinical spectrum of primary hyperoxaluria type 1: Experience of a tertiary center. Nephrol Ther. 2017 May. 13 (3):176-182. [Medline]. Çeltik A, Şen S, Yılmaz M, Demirci MS, Aşçı G, Tamer AF, et al. The effect of hypercalcemia on allograft calcification after kidney transplantation. Int Urol Nephrol. 2016 Nov. 48 (11):1919-1925. [Medline]. Kim S, Kyung C, Hwang C, Lee JE. furosemide induced medullary nephrocalcinosis mimicking Bartter syndrome. Yeungnam University Journal of Medicine. 2014 Jun 1. 31(1):21-4. Davidson Peiris E, Wusirika R. A Case Report of Compound Heterozygous CYP24A1 Mutations Leading to Nephrolithiasis Successfully Treated with Ketoconazole. Case Rep Nephrol Dial. 2017 Sep-Dec. 7 (3):167-171. [Medline]. Misgar RA, Hassan Z, Wani AI, Bashir MI. Amelogenesis Imperfecta with Distal Renal Tubular Acidosis: A Novel Syndrome?. Indian J Nephrol. 2017 May-Jun. 27 (3):225-227. [Medline]. Bhojani N, Paonessa JE, Hameed TA, Worcester EM, Evan AP, Coe FL, et al. Nephrocalcinosis in Calcium Stone Formers Who Do Not have Systemic Disease. J Urology. 2015 Nov 1. 194(5):1308-12. Barnett SM, Jackson AH, Rosen BA, Garb JL, Braden GL. Nephrolithiasis and Nephrocalcinosis From Topiramate Therapy in Children With Epilepsy. Kidney Int Rep. May 2018. 3 (3):684-690. [Full Text]. Schoelwer MJ, Viswanathan V, Wilson A, Nailescu C, Imel EA. Infants With Congenital Adrenal Hyperplasia Are at Risk for Hypercalcemia, Hypercalciuria, and Nephrocalcinosis. J Endocr Soc. 2017 Sep 1. 1 (9):1160-1167. [Medline]. Anders HJ, Suarez-Alvarez B, Grigorescu M, Foresto-Neto O, Steiger S, Desai J, et al. The macrophage phenotype and inflammasome component NLRP3 contributes to nephrocalcinosis-related chronic kidney disease independent from IL-1-mediated tissue injury. Kidney Int. 2018 Mar. 93 (3):656-669. [Medline]. Alhazmi HH. Renal oxalate stones in children with Zellweger spectrum disorders. Saudi J Anaesth. 2018 Apr-Jun. 12 (2):332-334. [Medline]. Liu S, Gao B, Wang G, Wang W, Lian X, Wu S, et al. Recurrent primary hyperoxaluria type 2 leads to early post-transplant renal function loss: A case report. Exp Ther Med. 2018 Apr. 15 (4):3169-3172. [Medline]. Rios JFN, Zuluaga M, Higuita LMS, Florez A, Bello-Marquez DC, Aristizábal A, et al. Primary hiperoxaluria diagnosed after kidney transplantation: report of 2 cases and literature review. J Bras Nefrol. 2017 Oct-Dec. 39 (4):462-466. [Medline]. Al-Bderat JT, Mardinie RI, Salaita GM, Al-Bderat AT, Farrah MK. Nephrocalcinosis among children at king hussein medical center: Causes and outcome. Saudi J Kidney Dis Transpl. 2017 Sep-Oct. 28 (5):1064-1068. [Medline]. Daga A, Majmundar AJ, Braun DA, Gee HY, Lawson JA, Shril S, et al. Whole exome sequencing frequently detects a monogenic cause in early onset nephrolithiasis and nephrocalcinosis. Kidney Int. 2018 Jan. 93 (1):204-213. [Medline]. Park E, Kang HG, Choi YH, Lee KB, Moon KC, Jeong HJ, et al. Focal segmental glomerulosclerosis and medullary nephrocalcinosis in children with ADCK4 mutations. Pediatr Nephrol. 2017 Sep. 32 (9):1547-1554. [Medline]. Paloian NJ, Leaf EM, Giachelli CM. Osteopontin protects against high phosphate-induced nephrocalcinosis and vascular calcification. Kidney Int. 2016 May. 89 (5):1027-1036. [Medline]. Braun DA, Lawson JA, Gee HY, Halbritter J, Shril S, Tan W, et al. Prevalence of Monogenic Causes in Pediatric Patients with Nephrolithiasis or Nephrocalcinosis. Clin J Am Soc Nephrol. 2016 Apr 7. 11 (4):664-72. [Medline]. Nonenhanced coronal CT scans through kidneys, showing cortical and medullary nephrocalcinosis (left kidney). Both kidneys appear scarred. Note thinning of renal cortex at upper pole of left kidney. Patient gave long history of chronic pyelonephritis, which is unusual cause of nephrocalcinosis. Ultrasonogram of right kidney in woman with nephrocalcinosis. Image shows hyperechoic foci in pyramids. Excretory urogram obtained at 15 minutes in man with renal papillary necrosis (most likely, patient with diabetes mellitus and repeated urinary tract infections). Image shows bilateral hydronephrosis and hydroureter due to obstruction by sloughed papillae at lower end of ureter. Plain kidney-ureter-bladder (KUB) radiograph in man with renal papillary necrosis (most likely, patient with diabetes mellitus and repeated urinary tract infections). Image shows bilateral renal calcification. Large, sloughed, and calcified renal papilla is present in region of left vesicoureteric junction. Note 2 pelvic phleboliths opposite ischial spine on right. The primary author would like to thank Dr Gurvinder Suri, Renal Fellow in the Nephrology Division at the University of Mississippi Medical Center, for his valuable peer review.